After comScore predicted a very healthy holiday shopping season for online retailers yesterday, Forrester is joining in, reporting that this holiday season is expected to generate $68.4 billion in U.S. online sales. That’s a 15 percent increase over 2011’s total and 3 percent higher than the expected overall annual online retail growth rate. Why the large increase? Forrester Analyst Sucharita Mulpuru says that the increasing number of consumers choosing the Web over physical stores and the rise in mobile commerce will help buoy sales this year. According to the report, the average U.S. shopper will spend $419 dollars online this holiday season, which is a 12 percent boost from last year. There are other trends that we will be seeing this year. More consumers are looking for deals, and the online retailers have “become synonymous with value.” Free shipping will also be a big factor this year — 57 percent of U.S. online adults shop more with retailers that offer free shipping and 27 percent add unplanned items to their carts in order to meet free shipping thresholds. Last year, 76 percent of the top 50 online retailers highlighted holiday deals on their homepages, and 50 percent called out holiday shipping promotions. We’re definitely going to see peak shopping during the Thanksgiving holidays and on Cyber Monday. 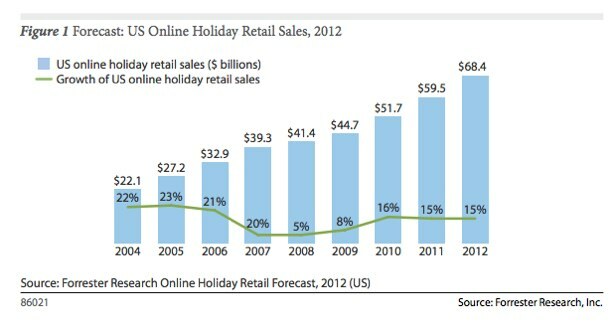 In the 2011 holiday season, the top 500 retail websites saw holiday traffic peak during Thanksgiving, Black Friday and Cyber Monday, each of which drove more than 170 million unique U.S. shoppers to the web. This accounted for more than $2.5 billion in total online sales. Lastly, retailers need to engage in loyalty rewards or personalized offers to help differentiate their businesses.